Hello every body, hello !! I want to share with you today the recommendations reiterated by Cyril, "Le Père Lucien" and yet too little heard or applied even on the French forum. 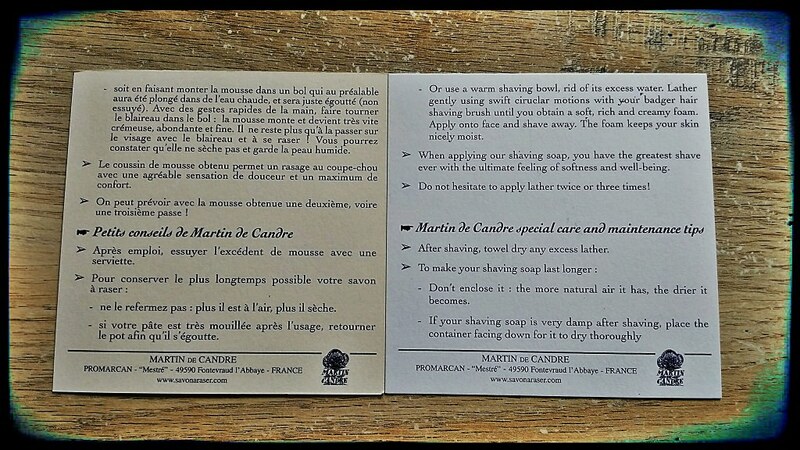 these recommendations are exactly the same as those written in black on white on the Martin De Candre site, so they are not valid only for Cyril's soaps but for all soft soaps. Cyril conducted a study over several weeks with a daily weighing of a soap after use whose weight increases slightly because of the water it absorbs and then a daily weighing for the minimum number of days or the soap must remain open to evacuate all the water absorbed during use. Cyril recently revealed the results of this study, and the soft soaps "Father Lucien" need to stay 4 to 5 days open in order to see their weight return to their original mass. you will understand, 24 hours of open drying is not enough at all not more than 48 hours or 72 hours. It is imperative that soft soaps stay open for 4 to 5 days to dry completely and harden over time. scent side, no risk, although the scent in time will be refined, it will not disappear from your soap. Our tip: to preserve your soap all its qualities we recommend that you leave it open permanently, it will dry, become harder and more economical and its fragrance will pleasantly scent your bathroom. I prefer to keep my LPL Oud-Santal soft, so I cover it after every shave. I haven't had any problems with it. However, I know some members here leave their LPL Oud-Santal uncovered so it gets harder. It should be noted that there were some problems with Oud Sandals that were closed after each shave, Cyril has recovered several members who did so and who complained either a change of texture with christallization or a change of the scent. Cyril following these incidents carried out this study to understand the source of the concern. Indeed, Cyril now recommends not to close his soaps again. this is what I do with my LPL with tallow which they tend to quickly absorb water. The other LPL not with tallow or Lainess, I close them after 4 to 5 days of personal drying. I'm aware of some LPL soaps cystallizing, although I haven't read about Oud-Santal in particular doing that. I first ordered Oud-Santal in February 2017, when it was released as a TSN/LPL Limited Edition. I've always covered it right after every shave, and it has not crystallized or otherwise changed in consistency. Here is the soap today. The consistency and scent are the same as when the soap was new almost nine months ago. 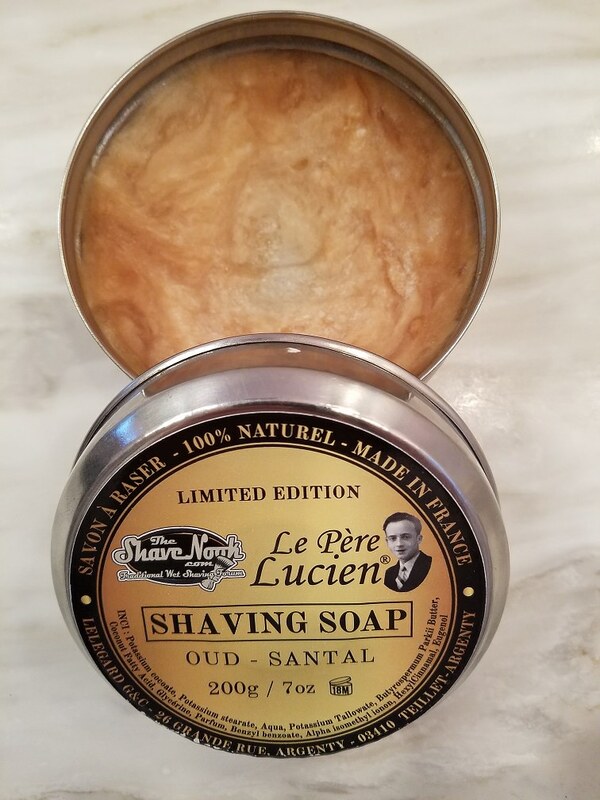 I don't know why some LPL soaps develop this issue, but I have not encountered it with either Oud-Santal or Apricot. However, it's only cosmetic and doesn't affect the performance of these excellent soaps. - your frequency of use is much less important than that of the owners concerned. - your indoor humidity is particularly low which promotes drying even closed. My LPL unscented soap began to crystallize within days after its first use. It however always remained firm. On the other hand the Oud-santal has not crystallized, yet the consistency remains quite soft despite leaving it uncovered all the time. Perhaps when my first tub is used up, the second will by then have dried out more... I’ve grown to quite enjoy the LPL O-S and am willing to overlook these idiosyncrasies. it is quite logical that the Oud Santal even always open remains relatively soft because of the proportion represented by the tallow. It will harden in time but will never be really hard, it will only become less sticky when you put your finger on it. I had a tub crystallize to the point it would no longer lather for me , just foam and airy lather. I ended up throwing the puck away as I couldn’t even use it for hand soap. 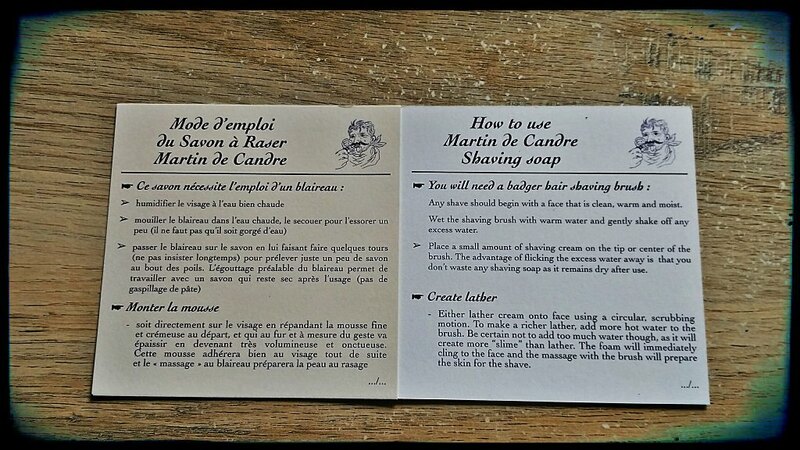 I wasn’t aware of any need to let the soap dry a certain way , hopefully the gents interested in purchasing the soap will read up first before making the mistake I did.